See more in the Restraint Photo Gallery. 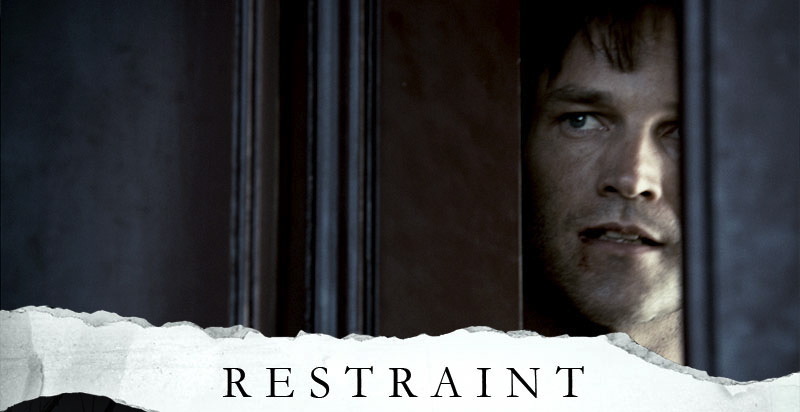 Stephen Moyer talks about his character and the making of Restraint. I especially loved watching the relationship develop between Andrew and Dale. Such a gentleman, so sweet and vulnerable, yet still with a slight edge. Who would not fall for Andrew? I did. Interestingly enough, this was another (of the many) Stephen Moyer roles where the protagonist is not everything he appears to be!! I get ya, dude! I completey adore Restraint. One of my fav Stephen movies. He is able to really stretch his acting talents with this one. Good guy, bad guy, lover, fighter, sane, insane, honest, liar, frightened, furious…….. He takes you through twists and turns. I love it. They could have explored Andrews character so much more. He had great chemistry with Dale but I also thought his interactions with Ron amazing. We need so much more Stephen movies. He is just such a great talent. OK the movie is on right now on “Chiller”. I hope they don’t kill him. They didn’t kill him but oh my, anywho, the b***h deserved it. Just caught this one on Chiller Channel today! Totally unexpectedly! Was so excited to see the whole thing! I’d only seen a few scenes before. The only other Stephen Moyer acting I’ve been able to see once I discovered him in TB is The Starter Wife. So this movie blew me away!! He is the HOTTEST thing ever to get in water!